Like most people, I absolutely love carnivals. They do tend to be full of nothing but joyous times, after all. But alas, such is clearly not the case in Strangeland, as the one depicted here seems to be overflowing with despair, nightmarish creations and otherworldly horrors. 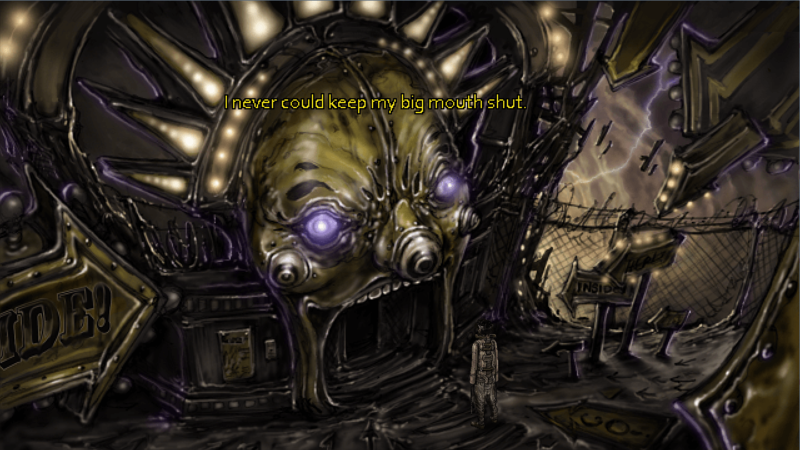 Almost makes me feel bad for the protagonist – if not for the fact that he’s set to star in what’ll hopefully be an incredible point ‘n click adventure, from Wormwood Studios, creator of Primordia. The beginning of this one, this… Strangeland, started approximately a year ago (May 2017), under the name The Wretched Refuse (so glad they changed it, by the way), planned as a project spanning less than a month, start to finish. Obviously, seeing how we’re now in March of the following year, things didn’t quite go as planned, although they are now “well past the clunk-a-clunk-a-clunk uphill part of the roller-coaster and onto the omigod-im-going-to-die downhill part”. Game development. Never as easy as it might seem. Never. Don’t underestimate it. A man awakes in an otherworldly carnival and watches a gold-haired woman hurl herself down a bottomless well for his sake. He seeks empty answers from mocking ravens, an eyeless scribe, a living furnace, a mismade mermaid, and many more who dwell within the park. That said, if all goes according to plan, their hard work and troubled times will have been worth it once when the game hits digital store shelves… soon? Maybe? We’ll see. Now, while no distribution platforms have been revealed, chances are we’ll be able to purchase the game from Steam, itch.io, GOG.com and Humble, as those are the ‘big ones’ nowadays. Whatever ends up happening though, in spite of knowing little about Strangeland at the time of writing, I’m already more than a little excited at the prospect of such a unique point ‘n click adventure! Fingers crossed.